Draft: 2012, Atlanta Braves, 1st rd. Was selected by the Braves in the first round (21st overall) of the 2012 first-year player draft...in 2017 was a mid-season International League All-Star...in 2015 was an Arizona Fall League Rising Star...started for the West squad in the AFL All-Star Game...in 2013 was an MiLB.com Braves Organization All-Star...was International League Pitcher of the Week for 4/17-4/23, 2017 & 7/2-7/8, 2018 and Southern League Pitcher of the Week for 8/18-8/24, 2015...entered the 2014 season rated by Baseball America the Braves' top overall prospect and their minor league pitcher with the best curve ball...was the Braves' 2012 Minor League Pitcher of the Year...led all Braves farmhands with 12 wins...in 2012, following his first professional season, his curveball was rated by Baseball America the best in the Braves organization and the best secondary pitch of any pitcher in his draft class...through the 2016 season his curveball continued to be rated the best among all Braves minor leaguers. Attended Brookwood High School in Snellville, Georgia...as a senior in 2012 was named Georgia Region 8 AAAAA Pitcher of the Year after finishing 8-1 with a 1.19 ERA and leading Brookwood to the state championship game...before signing with the Braves was commited to attending Clemson University. On 7/30 was acquired from the Braves, along with RHP Matt Wisler and OF Preston Tucker, in exchange for LF Adam Duvall...the next day was optioned to Louisville, where he made 5 starts before he was promoted to the Reds as a September callup...made all 3 of his apps for the Reds in relief before he became hampered by a right teres major strain...for the Reds, appeared in games on 9/2 at StL, 9/5 at Pit and 9/9 vs SD...didn't pitch again after 9/9...on 9/1 was promoted from Louisville, along with IF Blake Trahan (TRUH-haw)...on 9/2 at StL became the 32nd pitcher to appear for the Reds, tying the 2016 franchise record for pitchers in a season. Made his major league debut on 8/1 vs. LAD after beginning the season in Triple-A Gwinnett's rotation…Finished the season in the Braves rotation after also working in relief for Atlanta... Tossed 6.0 innings and allowed three runs, earned, and six hits with no walks in his MLB debut on 8/1 vs. LAD after the team recalled him from the G-Braves earlier in the day...Became just the fifth starter in Atlanta franchise history to not walk a batter in as many innings during his MLB debut...Also become the first starter in Atlanta franchise history (since 1966) to make his debut against Los Angeles (NL)... Sims and INF Ozzie Albies both made their MLB debuts on 8/1, becoming the first pair of Braves teammates to be in the starting lineup of their first big league game since RHP Al Santorini and C Walt Hriniak on 9/10/68 vs. SF... Earned his first career win in his fourth career start on 8/17 at COL...Allowed two earned runs through 5.0 innings... Worked out of the bullpen for four appearances, 9/7-16…Did not receive a decision out of the bullpen while compiling a 4.26 ERA (3 ER/6.1 IP)... Returned to the rotation for his final three appearances of the season, starting on 9/20 vs. WSH…Took a no-decision after going 5.0 innings and allowing one run in a 7-3 loss... Went 3-6 with a 5.79 ERA (33 ER/51.1 IP) in 10 starts... Righties hit .341 (15-for-44) with a .614 slugging percentage and three home runs against him in his first three starts…Then limited them to a .241 (20-for-83) average and four homers over his final 11 appearances... Compiled a 3.49 ERA (11 ER/28.1 IP) in seven home games, four starts…Pitched to a 7.67 ERA (25 ER/29.1 IP) in seven road games, six starts... Until his recall to Atlanta's active roster, spent the entire season with Triple-A Gwinnett...Led Gwinnett in starts (tied, 19), innings (115.1) and strikeouts (132). At the time of his recall, his 132 strikeouts were most in the International League, tied for eighth most in MiLB and led all Atlanta minor leaguers... Named an International League Mid-Season All-Star after going 6-4 with a 3.98 ERA and 104 strikeouts in 17 starts prior to the break... Issued a career-low 2.8 walks per 9.0 innings (36 BB/115.1 IP) with the G-Braves, after walking a career-most 5.9 batters per 9.0 in 2016... Ranked as the No. 14 prospect in Atlanta's system by Baseball America entering 2017, and as the No. 19 farmhand in the Braves chain, according to MLB.com. Entered ranked as the Braves' 13th-best prospect according to Baseball America...The publication said he possessed the system's best curveball...Split the season between Double-A Mississippi and Triple-A Gwinnett, going a combined 7-11 with a 4.40 ERA (69 ER/141.0 IP) in 28 games, 27 starts…Struck out 159, the most among all Atlanta minor leaguers and tied for fifth most in MiLB…His strikeout total marked the most by an Atlanta minor leaguer since 2012, when RHP Aaron Northcraft fanned 160...Walked 92, the fourth most in all of the minor leagues...His 28 games tied his career-high total, done twice before and last in 2014 with High-A Lynchburg...Started the season with the M-Braves, making three starts and going 0-2 with a 1.84 ERA (3 ER/14.2 IP) and 26 strikeouts...Made his Triple-A debut on 4/23, dropping a 7-1 decision at Columbus after allowing two runs in 5.0 innings...Fanned 11 in his next start, a 7.0-inning, one-run no-decision on 4/28 at Toledo...Compiled a 9.24 ERA (39 ER/38.0 IP) over his next nine games, eight starts, 5/3-6/15...Returned to Double-A on 6/16 and went 5-3 with a 2.83 ERA (24 ER/76.1 IP) over his final 14 starts...Went 18.2 consecutive innings without allowing an earned run, 7/23-8/8. 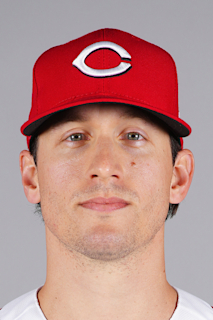 March 22, 2019 Cincinnati Reds optioned RHP Lucas Sims to Louisville Bats. September 1, 2018 Cincinnati Reds recalled RHP Lucas Sims from Louisville Bats. July 31, 2018 Cincinnati Reds traded Adam Duvall to Atlanta Braves for RHP Lucas Sims, RHP Matt Wisler and Preston Tucker. July 31, 2018 RHP Lucas Sims assigned to Louisville Bats. June 26, 2018 Atlanta Braves optioned RHP Lucas Sims to Gwinnett Stripers. June 23, 2018 Atlanta Braves recalled Lucas Sims from Gwinnett Stripers. May 29, 2018 Atlanta Braves optioned RHP Lucas Sims to Gwinnett Stripers. May 20, 2018 Atlanta Braves recalled Lucas Sims from Gwinnett Stripers. May 6, 2018 Atlanta Braves optioned RHP Lucas Sims to Gwinnett Stripers. May 5, 2018 Atlanta Braves recalled Lucas Sims from Gwinnett Stripers. April 20, 2018 Atlanta Braves optioned RHP Lucas Sims to Gwinnett Stripers. April 15, 2018 Atlanta Braves recalled Lucas Sims from Gwinnett Stripers. March 24, 2018 Atlanta Braves optioned RHP Lucas Sims to Gwinnett Stripers. August 1, 2017 Atlanta Braves recalled Lucas Sims from Gwinnett Braves. March 16, 2017 Atlanta Braves optioned RHP Lucas Sims to Gwinnett Braves. November 18, 2016 Atlanta Braves selected the contract of Lucas Sims from Mississippi Braves. June 17, 2016 RHP Lucas Sims assigned to Mississippi Braves from Gwinnett Braves. April 23, 2016 RHP Lucas Sims assigned to Gwinnett Braves from Mississippi Braves. January 7, 2016 Atlanta Braves invited non-roster RHP Lucas Sims to spring training. July 19, 2015 RHP Lucas Sims assigned to Mississippi Braves from Carolina Mudcats. July 3, 2015 Carolina Mudcats activated RHP Lucas Sims from the 7-day disabled list. June 25, 2015 Carolina Mudcats sent RHP Lucas Sims on a rehab assignment to GCL Braves. May 14, 2015 Carolina Mudcats placed RHP Lucas Sims on the 7-day disabled list. March 7, 2015 RHP Lucas Sims assigned to Atlanta Braves. March 31, 2014 Lucas Sims assigned to Lynchburg Hillcats from Rome Braves. April 1, 2013 RHP Lucas Sims assigned to Rome Braves from Danville Braves. July 11, 2012 Lucas Sims assigned to Danville Braves from GCL Braves. June 8, 2012 Lucas Sims assigned to GCL Braves. June 7, 2012 Atlanta Braves signed RHP Lucas Sims.